Schools are a resource for the whole community. Design needs to start with community consultation and to consider use of the school by the whole community. School buildings are valuable and need to be able to be reconfigured for different uses at different times of the day, night and weekends, by students, adult learners and the whole community. Schools are at the centre of the community in bad times as well as good. So schools need to be designed to not only survive a natural disaster, but be ready to function an an emergency relief centre for the community, with their own water and power supplies. Online consultation system: Consultation needs to happen from the start, so the first component of the FPC is a web site for consulting the community. The system provides for all phases of school development, from pre-planning, design, building, operation, maintenance, modification and relocation. The system allows the community to be consulted directly online and the text and video minutes of face to face town hall style meetings to be kept. The system will also hold all planning documents, in a legally certified e-records, to allow for audit of the process. Planner: Planner is an online application which allows anyone to design a school, using pre-prepared modules and test how it will look and work. Educator: Educator is an online extension of the school building, which provides an interface from computer screens in the building. But even before the building has been designed, educator takes care of the pedagogy (teaching to children), androgyny (teaching to adults), and heutagogy (self directed learning). The system provides a web site for e new facility and links this to other facilities on the campus, surrounding schools, community facilities and resources nationally and globally. Tech Modules: The physical school is built from one or more tech modules. These are 20 foot ISO shipping container sized units holding the pre-installed mechanical, electrical, water, waste and ICT systems. The tech modules also provide the basic structure the building is assembled around. The modules are filled with equipment, such as computers, solar panels, and water treatment systems, which is progressively unpacked as the building unfolds around the modules. Before lock-up stage, the models provide secure storage for the equipment and can be linked to a wireless security system. Flex Panels: The tech modules are only large enough to hold the mechanical systems for the school, there is no room in them for classrooms (and no one likes sitting in a shipping container anyway). The floor, wall and roof panels of the building are delivered folded in 40 foot ISO container sized cradles. The floor panels are unfolded onto the foundations and then the wall, ceiling and roof panels added. The cradles the panels were delivered on also form part of the structure of the building. The "twist-lock" connectors built into the standard shipping containers are used to secure the to the structure of the building to meet the highest Australian cyclone and earthquake codes. All windows are fitted with steel mesh for security and bushfire protection. The school provides flexibility by using compact movable furniture (delivered packed in the in the containers). Areas of the building can also be changed subtly by adjusting the colour and intensity of the low energy LED lighting and by the use of sound reinforcement. 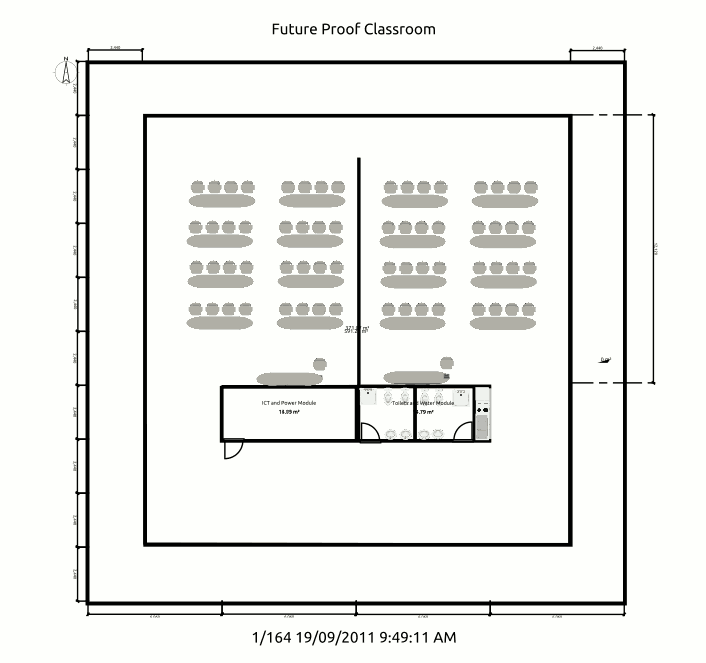 This allows the open space to be reconfigured for small groups, classes, learning commons, community library or public meeting. The building can be relocated by folding the panels back into the shipping cradles they arrived in. The components can be reassembled into two smaller buildings or several kits used to make one larger building. The brief called for up to 60 students to be accommodated, with per student 3.5 m2 for teaching (total 210 m2) and 9.75 m2 per student overall (585 m2 total). An initial design is for a building with a footprint the size of 40 ISO shipping containers, arranged in a grid of 4 x 10, to make a 24.232m by 24.3m building. The building is delivered as eight ISO containers: two 20 foot containers (ICT/Power Module and the Toilet/kitchen/water module) and three 40 foot panel cradles. The building can be transported as four trailer truck loads or four loads of the RAAF's C-17 cargo aircraft. 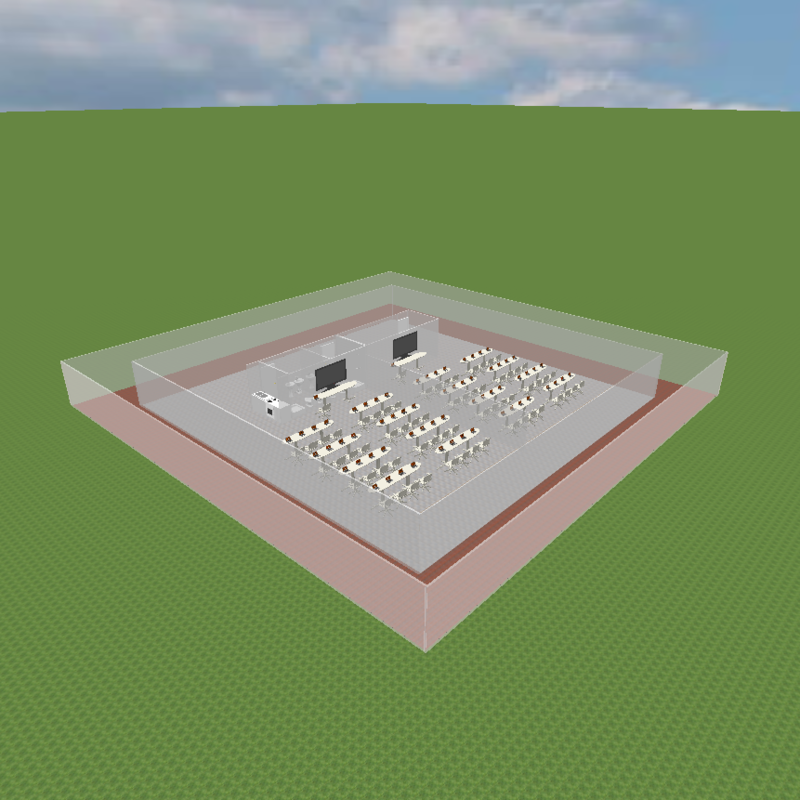 The building has no internal walls, apart from those of the tech modules and so the layout can be arranged as required. There is a screened veranda around all sides, to provide covered outdoor space. The roof can be changed from a low pitch for a contemporary look in inner city areas, to a suburban pitch, as required. The cladding is painted steel for durability and low cost and can have a full colour digital image applied with an industrial ink jet printer at the factory, to simulate any building material, architectural style or decorative effect required.